With today’s high energy prices and improving markets for mechanical insulation products, design engineers and facility owners have greater interest in reducing energy consumption by increasing energy efficiency. Further, facility owners are under pressure to do so in ways that reduce craft labor hours or use lower-cost craft labor. In looking for cost efficiencies, there is growing interest in the use of thermal insulating coatings (TICs). If energy costs remain high, or even increase, that interest is likely to grow. Since Insulation Outlook is an insulation magazine (and this author’s expertise is in thermal insulation), the rest of this article will discuss TICs as thermal insulation materials, rather than coatings. An evaluation of TICs’ role as coatings will be left to the coating experts. Further, because this magazine addresses mechanical insulation and its applications, this discussion is limited to TICs in mechanical insulating roles, not in insulating building envelopes. This author first conducted a study of TICs as a form of thermal insulation about eight years ago when working for a former employer. I learned that there are several different manufacturers in North America and that TICs contain a granular material, referred to by some at that time as ceramic beads. I also learned that TICs can be applied by brush or spray; and, in general, the coatings were rated for maximum-use temperatures of 500°F. One supplier sent me a sample in the form of a soup can that was coated on its sides with about one-quarter inch of dry insulating coating. The bottom of the can was not coated. The instructions were to pour hot water into the can while holding it by the sides, and to notice that I could continue to hold the can without getting burned. The instructions noted that a quick touch of the bottom of the can would show how hot the contents were. I followed the instructions and did, indeed, notice that I could hold the coated soup can indefinitely. While not scientific proof, it certainly demonstrated that the TIC could be an effective insulator, providing personnel protection from hot water. I also conducted some thermal analyses using the ASTM C680 computer code and concluded that there were some definite thermal benefits to be achieved with a thickness of one-eighth to one-quarter of an inch, particularly on relatively mild temperature surfaces of up to 250°F or so. However, it was clear that these thicknesses would require multiple coats, at about 20 ml/coat, so any potential labor savings from using the TICs were significantly reduced. I also noticed that with just several coats, heat loss could be reduced by at least fifty percent compared to the bare surface. Significant heat loss reduction could be achieved on surfaces up to 500°F (although it should be remembered that conventional insulation typically provides at least a ninety-percent heat loss reduction with a thickness of just one inch). For this article, I reviewed literature and technical information available on the Internet, as well as other sources. One company’s website contains some useful technical information for a product they classify as a ceramic coating, since it contains ceramic beads. It gives the thermal conductivity as 0.097 W/m-°K (0.676 Btu-in/hr-ft2 -°F) at 23°C (73.4°F). By comparison, the thermal conductivity of calcium silicate, ASTM C533 Type I Block, is 0.059W/m-°K (0.41 Btu-in/hr-ft2 -°F) at 38°C (100°F), a forty-percent lower value at a higher mean temperature. It appears that this particular ceramic insulating coating is not as good an insulator as calcium silicate. Still, the thermal conductivity could certainly meet the definition proposed above for a “thermal insulating coating,” particularly if it were applied in several coats. The thermal conductivity appears to be low enough to act as an insulation material with sufficient thickness. What was the hot surface temperature? What was the cold side surface temperature? What was the TIC thickness? What test procedure was used? The literature for this particular product gives a “K Factor Insulating Rating” of 0.019 W/m-°K (0.132 Btu-in/hr-ft2-°F). This value is about one-fifth that of the other TIC mentioned above, which is difficult to believe. Literature from another company, for whose product I could find no technical information, speaks generally to the company’s history and skilled experts who will help designers specify the company’s coatings. While I do not doubt that the company has technical experts, it would be helpful for them to provide potential users of their TIC products sufficient technical information to do a design. At a minimum, this information would include several thermal conductivities at corresponding mean temperatures. As an alternative, the literature should provide thermal conductance values at several service temperatures for several thicknesses, as well as surface emittance. An insulation designer cannot do a design without such technical information. In terms of labor required for installation, one supplier reported that a team of three painters can apply 3,000 square feet of a 20-mil TIC coat per hour, or 1,000 square feet per craft labor hour. This is impressive until one considers how much labor may be needed to add all the necessary coats. To apply a total thickness of one-eighth of an inch, which would require about six coats, the expected productivity would be about 167 square feet per craft labor hour. A one-quarter-inch thickness, which would require about twelve coats, would result in a labor productivity of about 83 square feet per hour. These productivity calculations, and the costs associated with those productivities based on the labor rate for local painters, should be compared to those for conventional insulation (which is a subject beyond the scope of this article). What Do Engineers and Designers Need to Design an Insulation System? Several TIC manufacturers mentioned their materials’ benefiting from reflective, low-emittance surfaces and stated that their performance is not predictable using standard calculation methodologies. For a design engineer or other designer of a thermal insulation system, however, it is critical to have this information. Typically, to do a thermal design (i.e., to determine the necessary insulation thickness), the designer needs a thermal conductivity curve (or a minimum of three mean temperatures minus thermal conductivity pairs) and the available thicknesses. To ensure that the correct application is used, the designer also should have the maximum and minimum use temperatures. Finally, if the insulation is to be left unjacketed, which should be the case with TICs, the designer would need the surface emittance. With this information, a designer should be able to determine the required insulation thickness for a particular orientation, pipe size (if applicable), pipe or equipment surface temperature, ambient temperature, and wind speed. With conventional insulation, the designer might use a tool such as 3E Plus® (available for free download from the North American Insulation Manufacturers Association at www.pipeinsulation.org). Regardless of the choice of design tool, thermal conductivity data and surface emittance values will be needed to design for a hot or cold surface application. For below-ambient application, in addition to the information noted above, the designer would need the vapor permeance and moisture absorption of the material. The designer needs to be assured that the design will prevent moisture migration into the TIC and then onto the chilled surface. Where Are Thermal Insulating Coatings Best Used? To determine where TICs might best be used, this author conducted some heat loss analyses using 3E Plus and thermal conductivity data provided by one of the manufacturers. To give TICs the benefit of the doubt, I used a constant thermal conductivity of 0.019 W/m-°K (0.132 Btu-in/hr-ft2-°F), the lower of the two values mentioned above. I do not have thermal conductivity values at temperatures other than an assumed 75°F mean, so I assumed that the TIC’s thermal conductivity increases one percent for every 10°F increase in mean temperature, which is approximately true for calcium silicate. Further, for personnel protection, I assumed a maximum allowable surface temperature of 160°F rather than the traditional 140°F because the latter assumes metal jacketing (not unjacketed) insulation material. As we know, hot metal has a high contact temperature, meaning that at a given temperature, the heat is transferred to the human body more quickly than from a material with a low contact temperature. Finally, I assumed that the TIC has a surface emittance of 0.9, which makes it easier to insulate for personnel protection than using a low surface emittance. I believe this is likely a good value to use, although it seems to contradict some of the TIC manufacturers who attribute their product’s performance to a highly reflective surface. With these assumptions, what did my calculations show for personnel protection? Using a TIC thickness in the range of 0.20 inches (i.e., ten coats at 20 mils per coat) on a 350°F eight-inch nominal pipe size (NPS) pipe in a 90°F ambient with 0 mph wind, I could obtain a surface temperature less than 160°F. 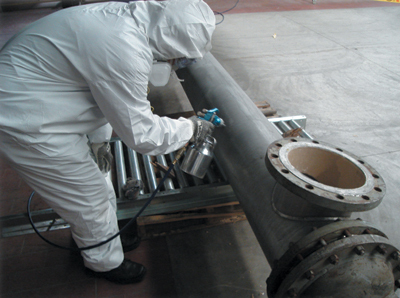 Thus, with a sufficient number of coats on a 350°F pipe, personnel protection could be achieved. I also evaluated the TIC for condensation control on a below-ambient surface and concluded that on a 60°F eight-inch NPS pipe in a 90°F eighty-five percent relative humidity ambient with 0 mph wind, I could prevent condensation with a 0.44-inch total thickness (i.e., twenty-two coats at 20 mil per coat). For a TIC to be effective for condensation control on a 50°F line, however, there probably would have to be a minimum of five-eighths inch, or thirty coats. Therefore, this thickness, for a TIC in a condensation control application, might be prohibitive from a total cost of labor perspective. One potential advantage of a TIC over conventional insulation may be for use on a 250°F or lower surface where corrosion under insulation (CUI) might be a problem with conventional insulation. First of all, only several coats would be required (probably six to eight) to provide a surface temperature of less than 160°F Assuming that the TIC can be shown to be an effective weather barrier, it may well have the necessary insulating value to provide personnel protection and simultaneously prevent CUI on surfaces up to about 250°F. Conventional insulation can have difficulty with such surfaces on outdoor applications because there is insufficient temperature to drive off any water that leaks through the jacketing and into the insulation. Additionally, if the designer has a below-ambient surface that needs insulation for condensation control, and that surface is difficult to insulate by conventional means, then a TIC may well prove to be the most cost-effective means of insulating that surface, as long as its temperature is above 60°F or so (i.e., not too cold). The designer needs to evaluate the total cost of both, however, including the labor required to apply the necessary number of TIC coats to provide condensation control. Only then will he or she know which insulation solution—conventional insulation or a TIC—is more cost-effective. What Standards Activities Are Planned? The ASTM Committee on Thermal Insulation, C16, will be holding a first Task Group meeting at its next semi-annual meeting in Toronto, Ontario, Canada, in late April of this year. The Task Group will focus on developing a test method for TICs—particularly one for use in mechanical applications. This Task Group meeting should prove to be valuable because it will give interested ASTM members the opportunity to evaluate the testing needs for TICs and the existing ASTM methods’ ability to meet those needs. 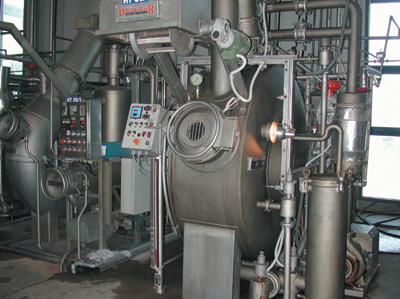 In terms of existing test methods, ASTM C177, the guarded hot plate apparatus, is typically used to determine the thermal transmission properties of mechanical insulation materials. It may not be ideally suited for evaluating the thermal performance of a thin TIC since it has a thickness of only about one-eighth to one-quarter inch and is sandwiched between plates. With no surface exposed to the ambient, it is precluded from reaping any particular surface radiation benefits that this novel type of insulation might have. The pipe test method, ASTM C335, could be ideally suited to the task because there is a surface exposed to the ambient and it simply measures the heat required to maintain a constant temperature of the simulated pipe. This test method by itself does not take into account the thickness of the material, and it does not need to. What you measure is what you get. Results can be expressed as thermal transmittance, thermal conductance, or thermal conductivity, depending on how one cranks the numbers. Since an appropriate test method already exists, there is arguably no need to develop a new test method for evaluating TICs’ thermal performance. However, I will leave that recommendation to this new ASTM Task Group. For their products to be specified for use in mechanical applications, TIC manufacturers must provide basic design information on the products. Further, any TIC technical information must be backed up by certified test reports available upon request by the owner or the architectural/engineering (A/E) firm doing the design. Design engineers require detailed engineering design information on the products they intend to use. Design professionals, whether working for a facility owner or for an A/E firm, cannot simply delegate an insulation design to a material manufacturer. Design engineers are paid to do engineering design. They, and their firm, are legally liable for the accuracy of that design. To control the design output, they must control both the design input and the computational methodology. If some TIC manufacturers are concerned that the use of thermal conductivity for their products is misleading, they must provide thermal transmittance data for different thicknesses at different service temperatures. I believe this data can be accurately obtained using ASTM C335 for above-ambient temperatures. Greater openness on the part of TIC manufacturers about their products’ performance will translate to greater respect from the design community and owner/operators of industrial facilities. From this openness and respect—and demonstrated thermal performance—acceptance of TIC products will follow, and specifications can then include TICs for suitable applications. Acknowledgements: The author spoke to a number of specifying engineers to get their opinions and perspective for this article. He is grateful for their assistance. Note: The opinions and information shared by the author in the preceding article are his and have not been confirmed by the NIA. Nanotechnology developed thermal insulating coating over pipe. Nanotechnology developed thermal insulating coating over textile mill.